Students will practice their numbers from one to ten with this fun watermelon-counting bulletin board. Make 10 watermelon slices out of red and green paper. On each slice, glue a different number of seeds (cut from black construction paper) from one to ten. To assemble the board, you can put the watermelon in order from smallest to largest and place the numbers 1 to 10 underneath them. For older preschoolers, you can mix up the slices when you put them on the board. Place a small piece of tape or Velcro under each slice and on the number cards as well. Attach an envelope to the board. Place index cards with the numbers 1 to 10 written on them in the envelope and let the students match the numerals with the watermelon slice that has the corresponding number of seeds. Make a fun beach bulletin board to review shapes with your preschool students. Cover the bottom of a bulletin board with yellow or tan paper and the top blue to make a beach. Then add pictures of different things you would see at the beach in different shapes, such as beach balls (circles), starfish (stars) and beach towels (rectangles). You can even make fish with square or diamond shaped bodies and triangle tails. Add in other things you find at the beach like beach umbrellas, shells and people. Label the different shapes or make the bulletin board interactive and put a sign in one corner asking the children to see how many of each shape they can find. Place a large United States or world map on one bulletin board. Send a letter home to parents asking if they will be taking a vacation over the summer and where they will go. Then mark the locations of everyone’s vacation spots on the map with a colored pin and a small picture of each child. Talk about the different places that will be visited. Are they big cities? Beaches? National parks? If you will have students during the summer, encourage them to bring in a picture of something they saw on vacation to put around the map. You could also use this bulletin board when school starts in the fall. Here’s a fun summer bulletin board that your students can help you make! 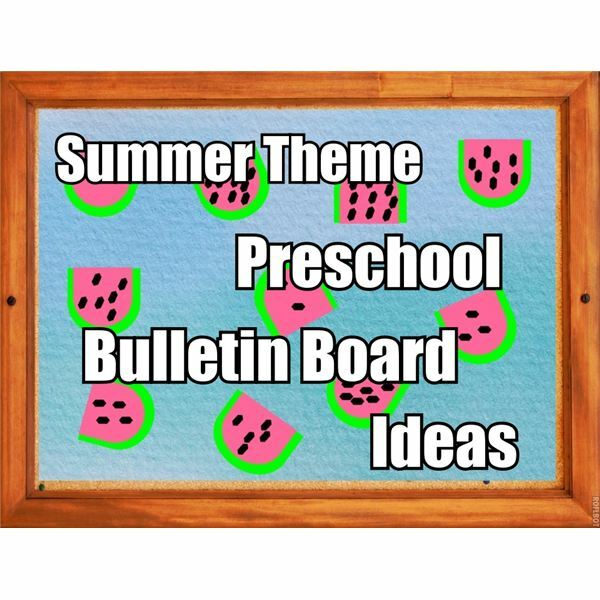 These preschool bulletin board ideas for summer themes are sure to bring summer fun and learning into your classroom. Find crafts, activities, books and more for a preschool unit about summer.